Please welcome my favorite fun-loving fatty, Travis (a.k.a. Travy G) from I Like to Fish! If you've never been by his place, you are seriously missing out! Have a taste of his flair here, then head on over to his place and check it out! So I’m supposed to do a travel themed post for That One Mom’s blog today. I could tell you about my last trip to the lavatory, but somehow I don’t think that’s classy enough to be on here. I could tell you about my trip to NYC recently to be on the Tyra show, but I’m writing a small book on that, and I don’t want to give anything away. …And I’ve just decided to go with a post from WAY back in the day when I first start blogging. It’s a classic, and it is guaranteed to bring you a smile! I made a decision last night. I was laying in bed, and I say to myself, "Travis, you're a fat guy. And no one believes you're gonna get any other way." I replied, "Self, people like you fat. You're a funnier person when you're fat." And I said, "Well what about skinny funny people, like Daniel Tosh and Dane Cook?" To that I replied, "Good point." After this little internal dialogue, I decided I was gonna start excercising. 2 miles! That's it! That's what I'll walk tomorrow! As I decided this, I kind of fell asleep. When I woke up this morning, I decided to go through with it. 2 miles. I laced up the Nikes, put my Ipod on shuffle, and headed out. This is the route I chose. 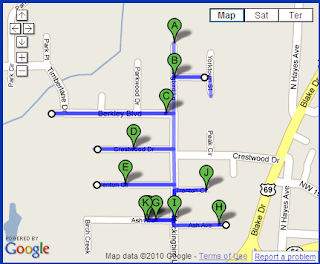 I marked some points on the way so that we could discuss some events that happened as I was walking. These points are not in alphabetical order, mainly because I can't seem to work google maps very well. K.) This was the start. It was here that I fully realized that it was about 103 degrees outside, and the possibility of me dying was a very real one. I decided to leave my cell phone at home, because I can't text and walk very well, and lets face it Statgirl, I would have been texting. G.) It was here that my Ipod earphones didn't seem to want to cooperate. Actually, they aren't my earphones, they are The Missus's. She was kind enough to let me sweat on them for a while. Anyway, at this point, I decided to call it quits. If I can't have an Ipod, I'm not walking. Then I turned around and saw The Missus taking a bag of trash out, and I had to keep going for appearances. I finally got the headphones to work. Dang. A.) This is the turn around point to start walking back and go down side streets. That little loop it shows on google isn't there, let me tell ya. It was here that I really started to sweat good, and I even felt pretty good about myself. B.) I almost saw a traffic accident here. Both people were idiots, and would have deserved to hit each other. It doesn't help things that the roads in this area are narrower than George Bush's reasons for attacking Iraq, either. And that people like to park on the sides of the street instead of IN THE FREAKING DRIVEWAY!!! C.) When I turned down this road, I almost quit. It is LONG. I didn't realize how long this road was, because in my original drive of the route, I didn't take it. I had a vision of myself lying passed out in the road baking like a pale skinned sea lion, but I pressed on. E.) Here I passed a Grandmother and a granddaughter headed swimming. They had towels, and what appeared to be bathing suits, and were walking across the street to the neighbors house. They looked at me funny when I started following them, so I pressed on. On second thought, it was so hot, they may have just needed towels to be outside. J.) Here I passed a man with a water hose spraying down his driveway. The ONLY thing that kept me out of that spray was the fact that I paid $100 for my Ipod, and I didn't wanna ruin it. That was the only thing. Damn how strange he might of thought I was. I didn't care. I was DYING. I.) Here I had to really fight to just hook a right and return back to my house. I had stopped sweating at this point, which is dangerous, and I was also getting rather dizzy. I really don't like to quit things though, and I told myself that I had just a little bit left, and I could do it. I have to give credit to the Ipod, and the folks at Apple too. It started playing a very moving and catchy song at this point. H.) It was at this point that I truthfully thought I was done. My stomach was cramping, my vision was blurry, and I was walking kind of sideways. It was pitiful. But that's not all. It was here that a transformer somewhere in the neighborhood blew. I didn't know that at the time. It sounded like a freakin gunshot. I dropped to the ground, and ninja rolled behind a car. This is true testament to the fact that no matter how unconscious I am, I can always be counted on to be a complete and total vajay. Getting up, I realized I was almost done. F.) I'm HOME!!! Thank you, sweet sweet merciful Jesus. I made it. I did it. 2 miles. I drank around 34 gallons of water, and instantly sweated out 30. The other 4 made me immediately have to go pee. I was shaking, sunburned and my sugar was probably 12. Heck, I take that back, it was probably normal. But I made it. 2 miles. After 20 minutes, Kid Funk asked if my heart rate had gotten over 100 during the walk, and I told him I didn't know. I took my heart rate then, and it was exactly 100. 20 MINUTES AFTER THE WALK! Geez. I know round is a shape, but I'm out of shape. That's real. Will I be going out again tomorrow? Damn right I will. Someone come with me, and bring a wheelbarrow. I reread this story, and my heart rate went up again. I almost died that day. Sounds like a great journey. I hope you stuck with it. Maybe a jog? Oh, man, I'm sweating just reading that! Whew. The temp alone would have stopped me. Oh, that and the fact that I'm lazier than, well, nearly everyone.